Is A Canine Cardiomyopathy Being Created By Crazy Chow? reports of canine dilated cardiomyopathy (DCM) in dogs eating certain pet foods containing peas, lentils, other legume seeds, or potatoes as main ingredients. These reports are unusual because DCM is occurring in breeds not typically genetically prone to the disease. Dilated cardiomyopathy refers to a disease of the heart muscle characterized by enlargement and global weakness of the main pumping chambers, the ventricles. The image below is from the echocardiogram of a human with a severe dilated cardiomyopathy. Humans with DCM experience weakness, shortness of breath and swelling in the legs due to heart failure. Severe cases of DCM are at risk for dying suddenly. Heart disease is common in our companion animals, affecting 10-15% of all dogs and cats, with even higher rates in Cavalier King Charles Spaniels, Doberman Pinschers, and Boxer dogs. typically occurs in large- and giant-breeds, such as Doberman pinschers, Boxers, Irish Wolfhounds, and Great Danes, where it is thought to have a genetic component. Is Doggy Dilated Disease Due To Demented Diets? “In the last few years I’ve seen more cases of nutritional deficiencies due to people feeding unconventional diets, such as unbalanced home-prepared diets, raw diets, vegetarian diets, and boutique commercial pet foods. The pet food industry is a competitive one, with more and more companies joining the market every year. 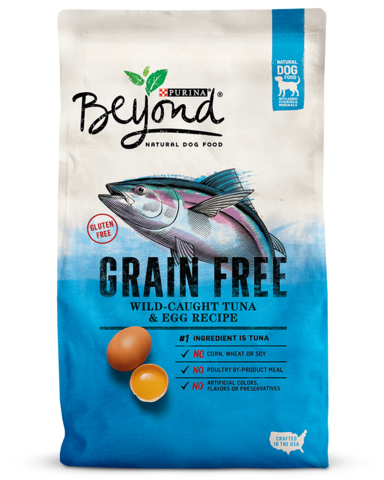 Marketing is a powerful tool for selling pet foods and has initiated and expanded fads, that are unsupported by nutritional science, including grain-free and exotic ingredient diets. All this makes it difficult for pet owners to know what is truly the best food for their pet (as opposed to the one with the loudest or most attractive marketing). Because of the thousands of diet choices, the creative and persuasive advertising, and the vocal opinions on the internet, pet owners aren’t able to know if the diets they’re feeding have nutritional deficiencies or toxicities – or could potentially even cause heart disease. Apparently, it has become trendy in the pet world (just like the human world) to vilify grains as in this article highlighting potential signs of doggy grain allergy at the dogbaker.com. Many pet owners have, unfortunately, also bought into the grain-free myth. The fact is that food allergies are very uncommon, so there’s no benefit of feeding pet foods containing exotic ingredients. And while grains have been accused on the internet of causing nearly every disease known to dogs, grains do not contribute to any health problems and are used in pet food as a nutritious source of protein, vitamins, and minerals. The FDA alert notes that in 4 cases of doggy DCM (3 of which were golden retrievers) taurine levels were low and with a change back to a normal diet and taurine supplementation the cardiomyopathy resolved. However, some reported cases had normal taurine levels. Reconsider your dog’s diet. If you’re feeding a boutique, grain-free, or exotic ingredient diets, I would reassess whether you could change to a diet with more typical ingredients made by a company with a long track record of producing good quality diets. And do yourself a favor – stop reading the ingredient list! Although this is the most common way owners select their pets’ food, it is the least reliable way to do so. And be careful about currently available pet food rating websites that rank pet foods either on opinion or on based on myths and subjective information. It’s important to use more objective criteria (e.g., research, nutritional expertise, quality control in judging a pet food). The best way to select what is really the best food for your pet is to ensure the manufacturer has excellent nutritional expertise and rigorous quality control standards (see our “Questions you should be asking about your pet’s food” post). If you’re feeding your dog a boutique, grain-free, or exotic ingredient diet, watch for early signs of heart disease – weakness, slowing down, less able to exercise, short of breath, coughing, or fainting. Your veterinarian will listen for a heart murmur or abnormal heart rhythm and may do additional tests (or send you to see a veterinary cardiologist), such as x-rays, blood tests, electrocardiogram, or ultrasound of the heart (echocardiogram). 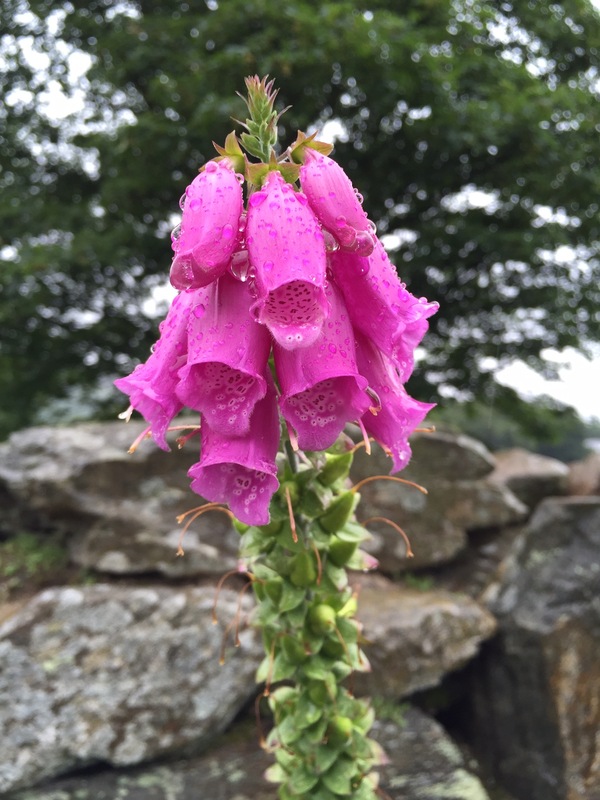 Has The Digoxin Death Knell Sounded: Farewell To Foxglove? The lovely but deadly foxglove plant encountered randomly on a hike through glorious Wales on a dreary, rainy day. 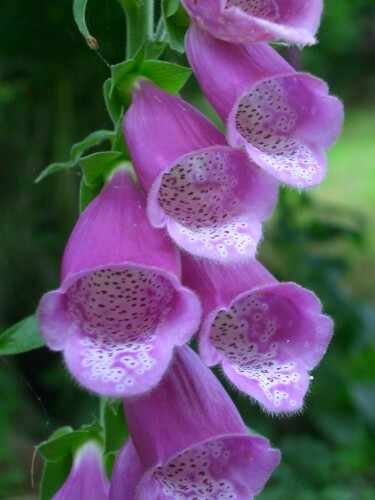 The skeptical cardiologist is fascinated by the cardiac drug digoxin and the plant from which it is derived, the foxglove. 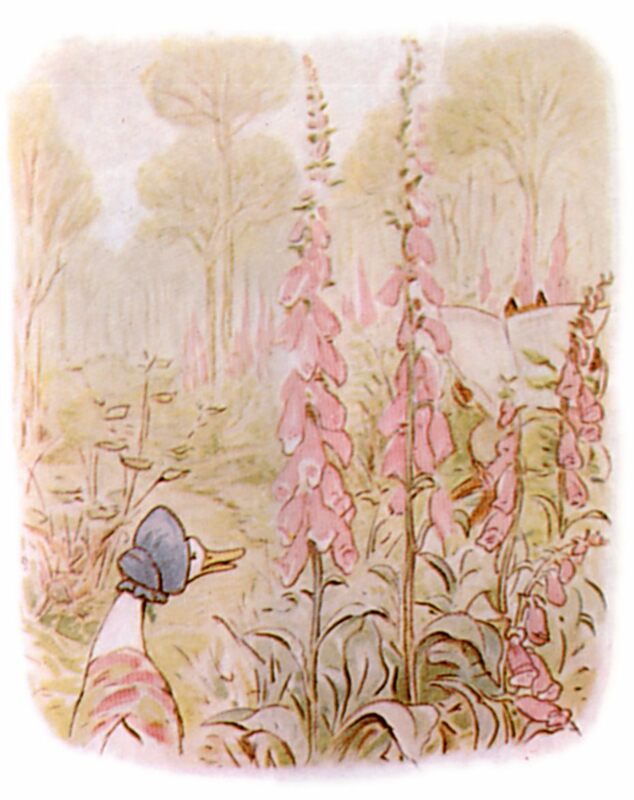 I wrote about “foxglove equipoise” in a previous post, touching on the contributions of William Withering in the 1700s, to understanding the toxicity and therapeutic benefits of the foxglove, and more recent concerns that digoxin increases mortality in patients with heart failure. At the American College of Cardiology Scientific Sessions in Washington, D.C. yesterday, a paper showing higher mortality for patients on digoxin may be the final nail in the foxglove coffin. Despite lack of evidence for its safety in the treatment of atrial fibrillation from randomized trials, digoxin is used in 30% of patients with atrial fibrillation (AF) worldwide, and current AF guidelines recommend it for rate control in patients with AF (with and without heart failure). The investigators used data from the ARISTOTLE study of apixiban versus warfarin for their analysis. -In patients already taking digoxin, mortality was not higher in digoxin users, however, the risk of death was related to dig levels: for every 0.5 ng/ml increase in dig level, the risk of death rose by 19 percent and if dig level was >1.2 ng/ml the death rate increased by 56 percent. –Patients not taking digoxin before the trial who began taking it over the course of the study had a 78 percent increase in the risk of death from any cause and a four-fold increased risk of sudden death after starting digoxin use. Most sudden deaths occurred within six months after digoxin was started. –Risk of death with initiation of digoxin was increased in patients with and without heart failure. The use of foxglove to treat dropsy is a fascinating and instructive chapter in the history of medicine. This study added to prior systematic reviews suggests that it is time to end the use of digitalis and close the chapter. William Withering might turn over in his grave but at least we won’t be sending afib patients to join him prematurely! It’s not a word I hear outside of medical circles but it serves a great function in the clinical arena. When used in medicine as in the phrase “clinical equipoise” it means that medical experts are uncertain as to whether a treatment for a disease is helpful. Thus, for digoxin, a drug which has been utilized for patients with heart failure or atrial fibrillation for 240 years, we still don’t know if the benefits outweigh the risks. Digoxin is the major medicinally active chemical in the foxglove plant which was first described by Leonhart Fuchs (the plant and color fuchsia are named after him), a German botanist and physician in 1542. It was given the latin name digitalis purpurea, reflecting the plant’s purplish color and similarity to a thimble (German finger hut). A vague understanding that the foxglove had medicinal and toxic properties existed in subsequent centuries, but it took a very observant physician from the West of England, William Withering, to give it a sold footing in the medical pharmacopeia. Foxglove was in clinical equipoise in 1775. When Withering started giving it to his patients with dropsy he did not know if it would help or harm them. After trying various preparations of the foxglove in varying dosages in hundreds of patients he concluded that it was of a great benefit as long as it was carefully titrated to avoid the toxicities of overly slow pulse and vomiting. With modern medicines that are proven to be safe and effective we demand evidence from randomized controlled trials in which the active drug is compared to a placebo. There are too many factors which affect the course of a disease to accept the kind of observational evidence that Withering collected. Digitalis is currently utilized in heart failure and atrial fibrillation. Withering’s patients likely had one or both of these conditions. A recent observational study found that digitalis usage in patients with newly diagnosed atrial fibrillation was associated with a 26% higher risk of dying. The DIG study was performed in the early 1990s, before current optimal treatment regiments for heart failure with reduced ejection fraction were developed and may no longer relevant. 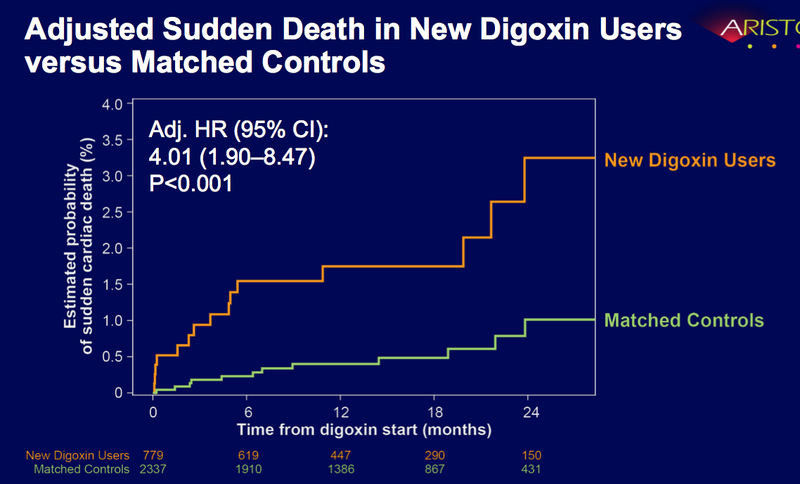 More recent observational studies suggest digoxin raises mortality in heart failure. Thus, the foxglove or digitalis, although used for 240 years in hundreds of thousands of patients for both heart failure and atrial fibrillation remains in clinical equipoise. Doctors must be very circumspect in prescribing this medicine. Personally, I do not use digoxin in heart failure patients. I use digoxin in chronic atrial fibrillation only as a last resort when other agents do not allow adequate slowing of the heart rate and I carefully monitor levels and kidney function if a patient is on it. From The Tale of jemima Puddle-Duck. Jemima… rather fancied a tree-stump amongst some tall fox-gloves. I have, however, decided to start growing foxglove in my garden. I will try to warn the ducks, rabbits and squirrels not to partake of its beautiful flowers as they might prove deadly. I also plan to visit the grave of Withering on my upcoming trip to Europe, for upon his tombstone it is said, there is an engraving of the foxglove! Are You Sabotaging Your Heart With Statin Drugs? No, you are not “sabotaging” your heart with statin drugs. Neither are you “wrecking” your heart. But that title probably got your attention if you are taking a statin drug and thought that it was helping your heart. What Brownstein says can be found on multiple similar sites across the internet which are promoting “alternative” or “natural” approaches to high cholesterol. These claims resonate with patients who are reluctant to take medications and who feel that “natural” approaches to prevention and treatment are superior. Brownstein uses a combination of alarmist rhetoric and pseudoscientific jargon that appeals to those seeking alternatives. Let’s look at his claims. Do Statins Prevent heart Attacks? Statins unequivocally prevent heart attacks in patients who have had heart attacks or have evidence of advanced vascular disease due to atherosclerosis. This is called secondary prevention and there are almost no cardiologists/scientists with any credibility who dispute the value of statins in secondary prevention. The only specific study that Brownstein cites is the ASCOT-LLA study, published in 2003 which looked at ten thousand patients with hypertension, no heart disease and low or normal cholesterol levels, half of whom got 10 mg of atorvastatin and half a placebo. This was a primary prevention study and showed such a benefit of the atorvastatin on reducing heart attack and coronary deaths that the study was stopped early, at 3.3 years at which time 154 patients receiving placebo versus 100 receiving atorvastatin had had heart attacks or died from coronary disease. This was a highly significant reduction in events. There are several ways to look at this data and present it to patients; Brownstein implies that “Big pharma” presented the most favorable way, which is that there was a 36% reduction in relative risk. The absolute risk of an event in the atorvastatin group was 1.7% (2.7% in the placebo group), so the absolute risk reduction was from 2.7% down to 1.7% or 1%. 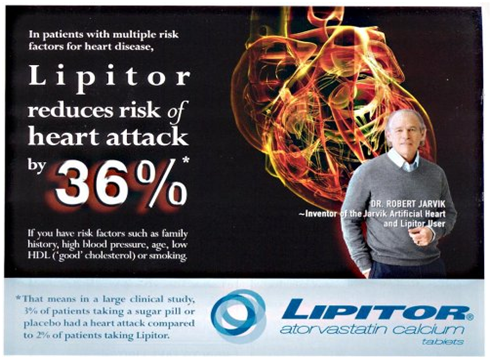 Understandably, Pfizer, the makers of atorvastatin, prominently displayed the 36% relative risk reduction in their direct to consumer marketing campaigns (featuring Dr.Robert Jarvik (proclaiming himself a doctor in direct to consumer videos), although he was never a licensed physician (see here for interesting discussion on the controversy that ensued)). Until, the FDA compels them to do otherwise, big pharma will project their products in the most favorable light possible. ASCOT really makes a strong case for taking a statin drug to prevent heart attacks, even in those with normal or low cholesterol levels, not the opposite, as Brownstein has implied. Do Statin Drugs “Weaken” The Heart Muscle Or Cause Heart Failure? After criticizing the now infamous “Seven Nations Study” of Ancel Keys, which found high fat consumption in countries with high rates of heart attacks, Brownstein trots out the weakest imaginable argument for statins causing heart failure: heart failure has increased in the last decades, statin use has increased, therefore statins are causing heart failure. Correlation does not equal causation! There is no compelling evidence that statins cause heart failure or weaken heart muscle. In fact, a recent review of heart failure and statins concluded that statins, while not reducing mortality in heart failure, do have favorable effects on reducing the rate of hospitalization for heart failure and increasing the strength of the heart muscle. Statins may not be as beneficial in patients with heart failure, but they definitely don’t cause heart failure. As is typical for this slick organization (see my previous post here), the writing has the veneer of science but is all pseudoscience with references that are outdated, irrelevant or meaningless. I’ve written about statin side effects and the decision to take them based on analysis of risks and benefits here and here. By far, the most common thing we see is myalgia, aching of the muscles, and this is reversible. The bottom line is that the benefits of statins far outweigh the risks if you are at very high risk for heart attack and stroke. The risks outweigh the benefits if you are at very low risk. For those in the middle, I advocate a search for subclinical atherosclerosis either by vascular screening or coronary calcium detection. 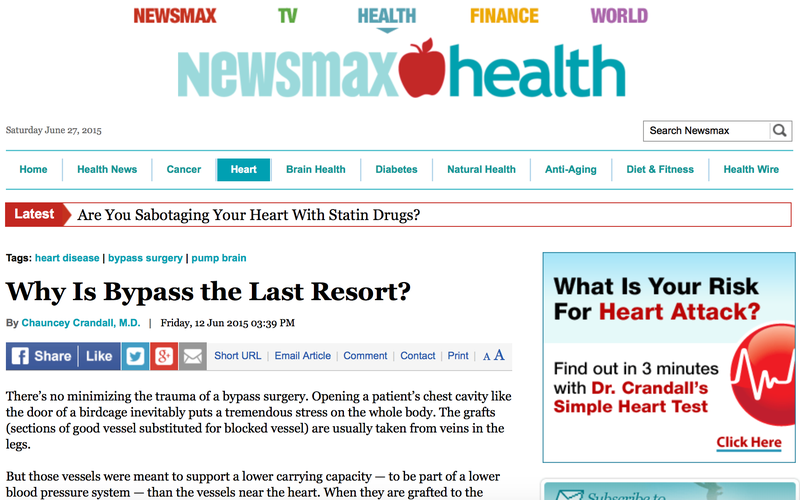 Brownstone is not the only purveyor of dangerous misinformation on Newsmax’s Health website. There seems to be a concerted effort to promote quacks and charlatans and any information on this website is suspect. Avoid sites that use scare tactics and inflammatory rhetoric to induce you to stop your prescription medication and buy a health newsletter or nutraceutical. By the way, Big Pharma has not brainwashed me. I have no ties to industry. I stopped taking any pharma food or money years ago. Listen all y’all, it’s not a sabotage! The skeptical cardiologist has been watching the Ken Burns documentary on the Roosevelts with the SOSC. I find TR fascinating and have always identified with him (bad eyesight, asthma, bullied as a child) but after he dies in the documentary, my interest flagged. The SOSC soldiered on, continuing to watch the series as FDR guided America through the Depression and into WW2. My ears perked up and I began watching again when I heard that FDR was diagnosed with severe heart disease and that this was kept secret from the public even after his death until 1970. In early 1944, he developed symptoms that his personal physician, Vice Admiral Ross McIntire, the Surgeon General of the US (an ENT doctor) thought were lingering aftereffects of the flu. Ultimately, a second opinion was sought and he was examined at the Bethesda Naval Hospital by a young Naval medical officer, Dr. Howard Bruenn. Dr. Bruenn, unusual for the time, specialized in diseases of the heart. The upstart cardiologist found the President had a markedly elevated blood pressure and an enlarged heart and diagnosed him as having heart failure. Mcintire refused to accept this diagnosis initially but was overruled by a panel of “honorary consultants” who agreed with Bruenn after listening to the facts. What fascinated me about this case was the very limited diagnostic and therapeutic modalities available to the cardiologist at that time, even for the most important person in the world. I tend to think of 1945 as in the modern era. After all, this is when the atomic bomb was developed and we had remarkably sophisticated ways of killing other humans. But in medical and cardiology advances, it was still the equivalent of the dark ages. 1. Physical exam. He was able to listen to the lungs and hear “sibilant and sonorous rales” which suggested fluid accumulation. He palpated the point of maximal impulse of the heart (the apex) and felt that it had shifted more laterally, thus suggesting enlargement. He heard a “blowing systolic murmur at the apex.” A murmur is basically a sound that corresponds to blood flowing across the cardiac valves, and when heard, often corresponds to a valve leakage (regurgitation) or narrowing (stenosis). The physical exam remains an important tool for cardiologists. It is free of radiation, cost and (usually) discomfort. It does take time and an experienced examiner to do properly. The findings are often not accurate enough to be sure about a diagnosis. For example, the crackling sounds or rales heard in FDR’s lungs could be due to fluid seeping into the small air sacs of the lungs from high pressures in the heart or they could be related to a lung problem (possibly related to his long time cigarette smoking). The murmur that was heard during systole (the time that the heart muscle is contracting or squeezing) could be due to leakage from the mitral or tricuspid valve, narrowing across the aortic valve or a hole between the left and right ventricles. 2. Vitals signs. Blood pressure and pulse with techniques essentially unchanged from today. BP was 186/108. Very high and in the range where one could anticipate damage to “end-organs” such as the heart, the kidneys and the brain. His resting pulse was 72 beats per minute. 3. Chest radiograph of x-ray. This test suggested congestion in the lungs and enlargement of the cardiac silhouette. Prior to the advent of more advanced cardiac testing, the only information on heart chamber sizes came from chest x-rays. We still utilize chest x-rays in heart failure patients to look at the lungs for fluid and congestion but their accuracy is limited. 4. EKG. The electrocardiogram had been utilized clinically to record the electrical activity of the heart since the early 1900s. FDR’s initial ECG is depicted below. He was in the normal rhythm but showed evidence for enlargement of the left ventricle and perhaps a problem with ischemia, our term for lack of blood flow to the heart. We still use these diagnostic tools to the present day, but recognize that a significant amount of heart failure patients will be misdiagnosed without more sophisticated testing and that the precise cause of the heart failure will remain obscure. By 1984, when I began my training in cardiology, cardiologists had developed the cardiac catheterization and the two-dimensional echocardiogram which precisely tell us about the complete anatomy and physiology of the heart. These tools, if present in 1945 would have allowed determination of the pumping function of FDR’s heart, the level of pressure within each chamber of his heart, the function of the valves (and cause of his murmur) and the presence of any blocked arteries supplying blood to the heart. Without them, his cardiologist could only speculate and without an autopsy (forbidden by Mrs. Roosevelt despite the urgent request of the Russian authorities who thought he might have met foul play) we will never know what was causing his symptoms with certainty. Once the diagnosis was made, FDR’s doctors had very limited treatment modalities available. In many cases, no treatment was given on the belief that the symptomatic patient would live for many years without complications. Furthermore, physicians did not want to frighten patients by creating alarm, often informing them of a “tendency” to high blood pressure. Patients were strongly advised to achieve mental and physical tranquility by living at a lower tempo, resting and sleeping long hours and avoiding the strains of work, heavy meals and emotional upset. A mental component was strongly suspected and sedatives such as phenobarbital, chloral hydrate and bromides were used and psychotherapy might be recommended. Alcohol in moderation was permitted and thought to be helpful as a sedative and vasodilator. Salt was stringently restricted,… Drug treatment was limited to thiocyanate and veratrum alkaloids, both highly toxic drugs that were poorly tolerated. 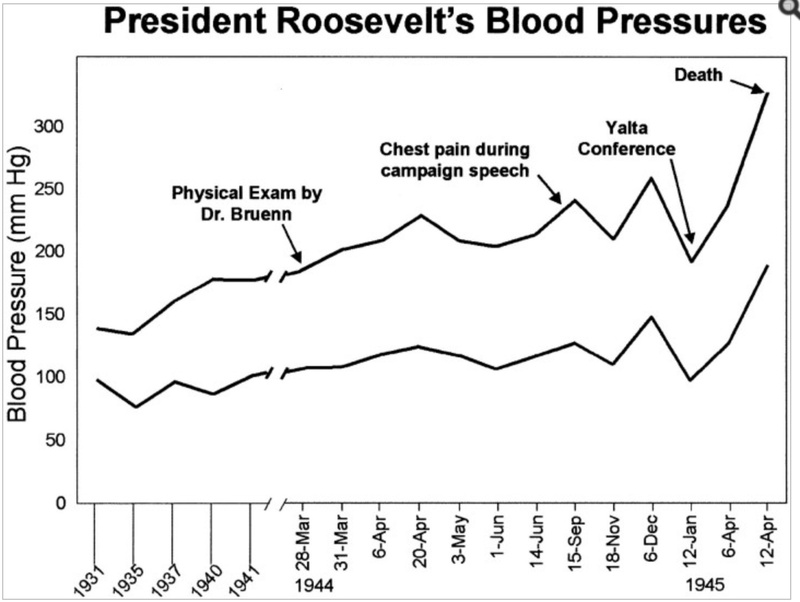 Despite the recognition that FDR’s BP was dangerously high and the likely cause of his heart failure, there were no medications available to lower his blood pressure. After FDR suffered his fatal cerebral hemorrhage his BP was recorded as “well over 300 mm Hg systolic” and 190 mm Hg diastolic, numbers higher than any I have ever encountered in my practice. Bruenn felt that FDR definitely had coronary artery disease, based on one episode of very typical chest pain during a speech. In 1946, one year after FDR’s death, Dr. McIntire wrote that FDR’s blood pressure and heart signs had been normal. Dr. McIntire has been accused by historians of destroying FDR’s medical records (they disappeared mysteriously) to hide his misdiagnosis and mismanagement of the President’s case. It wasn’t until the publication in 1970 by Dr. Bruenn of “Clinical Notes on the Illness and Death of President Franklin D. Roosevelt” in the Annals of Internal Medicine that the record was set straight. I obtained the EKG and BP graph of FDR above from that paper. Fortunately, in the years since FDR suffered from many of the consequences of untreated hypertension multiple effective and safe antihypertensive drugs have been developed. It is the rare patient now that we cannot get the blood pressure down to the current guideline level of 140/90mm Hg (150/90 for >60 years). With this success in BP reduction has come substantial drops in stroke, heart failure and heart attack rates. Are You Consuming Too Much or Too Little Salt? He is embarrassed to admit this, but the skeptical cardiologist has no idea how much salt he consumes. I have never stressed to my patients that they engage in obsessive assessment of their salt consumption. The data that everyone needs to limit salt consumption to , say 1.5 grams/ day, as the AHA recommends are not compelling. If asked, my typical response is to recommend not adding additional table salt from the salt shaker and to avoid processed and fast foods (which apparently accounts for 75% of salt consumed in the US). I definitely have some patients with hypertension and some with heart failure in whom watching for excessive salt consumption is important. One of my patients with fairly well controlled hypertension called me last week because he was recording blood pressures of 210/120. Before I could add another blood pressure agent he had decided to stop adding the salt to the tomatoes he was eating and over a period of a week the blood pressure came back to normal values. Manyl of my severe heart failure patients will report weight gain due to ankle swelling after a particularly salty meal. On the other hand, I have many patients who are symptomatic from low blood pressure. These patients have frequent episodes of dizziness and have been following the recommended low salt diet thinking that this was enhancing their health. When I get them to liberalize salt intake, blood pressures and their symptoms go away. Recent papers on salt consumption suggest that either too much or too little salt is bad for you and consequently the public must be totally confused on what they should be doing. Since I have high blood pressure which seems to randomly fluctuate I’ve decided to try to measure exactly how much salt I consume daily. Maybe I am consuming more than 5 grams daily (I think that is too much). This is not going to be an easy task. If i eat out during this time I’m not sure how I will have any clue what amount of salt is in the meal. If I decided to fry a couple of eggs this morning , I will shake some salt on them from the salt cellar. Is it possible to measure this amount? If I put some cheese on the eggs, will I need to precisely measure the amount of cheese? Looks like there are some free iPhone apps I can utilize to assist me in the process. To my readers and patients, please join me in this exciting and informative adventure. Over the next week, try to track your daily salt consumption and report the numbers to me. Or do it for one day. The Great Salt Measurement Challenge is On!